The new Aspire Cleito tank is one of the most powerful clearomizer on the market, with one of the most impressive vapor production you can find, short of using an RDA. It is top-filling, and features a unique coil design that replaces the central chimney for an incredible airflow and intense flavor thanks to its dual clapton coil. Introducing Aspire's latest innovation in clearomizers, the Cleito Tank! The new Cleito tank from Aspire is the latest innovation from the trusted vaping brand, it is a sub-ohm clearomizer with an all new coil design, that replaces the whole central chimney, with huge openings in the tank for the organic Japanese cotton to soak in the e-liquid, and allow the vapor to flow perfectly thanks to the unobstructed airflow. It is powered by a dual kanthal clapton coil at either 0.2ohm or 0.4ohm, that delivers incredible flavor and an intense amount of vapor. The Cleito is one of the most powerful tank on the market, with one of the most impressive vapor production you can find, short of using an RDA. 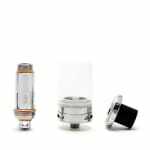 It features a stainless steel body, a 3.5ml pyrex glass tank, and a Delrin thermoplastic drip tip. 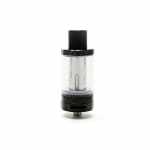 The Cleito is a top-filling tank, very easy to use and clean, however be advised that to change your coil you will have to drain the liquid out of the tank first. It comes packaged with a set of different colored "Cleito Cuffs", rubber rings that you can fit at the top of the tank to prevent over-heating when chain-vaping, and color coordinated with your preferred mod. If it ain't broke, don't fix it. The Cleito tank has continued to be a go-to recommendation for me when referring new vapers. Easy to use and maintain, replacement glass is easy to find, excellent quality coils and minimal leaking (from my experience). It doesn't have the "cool" aesthetics like some of the modern tanks but it you can look past the simple appearance of the Cleito, I would highly recommend it if you're looking to get a new or back up tank. Best tank I've ever bought! In comparison to other sub-ohm tanks I've tried, the Cleito takes the cake. Easy to fill, dismantle, and clean. The coil technology is great, providing nice vapour and flavour. And with the release of the Cleito RTA system, you get even more out of the tank in terms of customizability. A perfect tank for beginner and veteran vapers alike! Grabbed this tank a few days ago and I would like to say it's about day 3 and the coil still tastes amazing, which is hard to find for me personally, I had my crown tank and the coils were advertised to last over a month and by day 3 the cotton for me was already burnt, this tank, day 3 and the coil is still tasting awesome. This tank has good flavour, awesome airflow, and vapes pretty smooth. Drip tip gets hot, but if you drip, then that won't faze you hahah. - BEST flavour I've ever had. - huge cloud without sacrificing flavour. - Super cheap when compared the rest of the sub-ohm world. - Unique Drip-Tip, will be hard to find a replacement. - Gets very hot at times! Overall I really like this little tank. Maybe the version 2 will have a better way to change the coil!